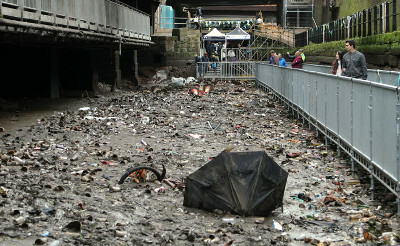 It took 15 volunteers three full days to clear just a single section of the Rochdale Canal in Manchester of its rubbish, including the usual cans and plastic bottles, but shopping trolleys, mobile phones and even a bar stool from just 80ft of the Rochdale Nine, Alan Tilbury reports. After the rubbish was being ignored by Canal & River Trust, the volunteers have now left at least a section of the canal as clear water with the rubbish consigned to waste dumps. The opportunity to clear the rubbish was as the trust had drained the waterway to repair a lock, leaving the bottom a sea of rubbish as can be seen from the photograph, that shows how the area had been so neglected. It is obvious from the rubbish collected that most of it has simply been thrown into the canal from the bars along the waterway, with people simply using it as a handy rubbish tip, with one volunteer wondering why Canal & River Trust have not put up notices asking people not to do it, but thinks that as others clear it for the trust they are not too bothered.